TRAILER ON SIDE — Grain trailer of the LSE semi flipped on its side in the accident. Both drivers escaped uninjured from a highway accident involving two trucks in Boone County last Wednesday, Jan. 23. A tractor-trailer rig was deemed a total loss, and a fuel delivery truck sustained extensive damage in the accident that occurred at about 11 a.m. on Highway 39 about 3.2 miles southeast of Albion. Both trucks were southbound, according to Sheriff Denny Johnson. The lead vehicle, a 2007 Freightliner fuel truck driven by Ryan Batenhorst of Columbus, had slowed to turn onto 290th Street. The following southbound tractor-trailer, a 2006 Peterbilt with grain trailer hauling soybeans, driven by Timothy Shoemaker of O’Neill, was unable to stop or pass on the left side due to oncoming traffic, and attempted to pass the fuel truck on the shoulder side. 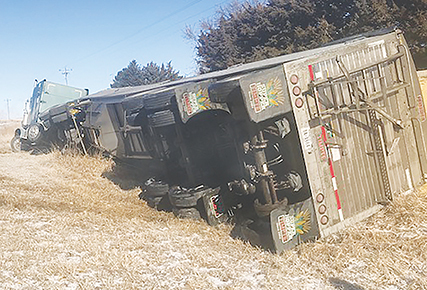 The semi clipped the right front of the fuel truck and was turned 180 degrees, crossing the highway and coming to rest in the east ditch, facing northwest, with the grain trailer tipped onto its side. The semi tractor-trailer, owned by LSE, LLC of Holyoke, CO, was deemed a total loss. Damage to the fuel truck, owned by Sapp Brothers Petroleum, (SBT, Inc.) of Columbus, was estimated at $10,000. Another accident was investigated by the Sheriff’s Department the same day at 5:18 p.m. on 310th Street, just north of 220th Avenue, or 1.5 miles east and four miles south of Cedar Rapids. Kristy McCready of Belgrade was driving a 2010 Chevrolet Cobalt eastbound on 370th Street, when a 1991 Ford pickup, driven by Rodney Cook of Albion, pulled onto 370th Street from a farm field entrance into the path of the Cobalt. In an attempt to avoid collision, the McCready vehicle veered off the south side of the road and came to rest in the ditch. There were no injuries, but the McCready vehicle was deemed a total loss. 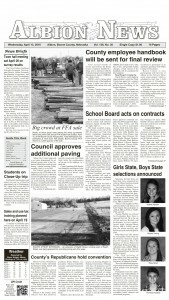 A car-deer accident was reported on Thursday, Jan. 11, on Highway 14 about 3.6 miles south of Petersburg. A southbound 2013 Ford Explorer, driven by Anita Krohn struck a deer that had run onto the highway from the ditch. The driver was not injured, but damage to the vehicle was substantial.